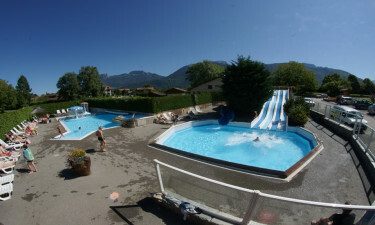 Camping Les Fontaines Campsite is a luxury camping site that can be found in the Alps region of France. This part of the country is famous for its intense natural beauty and lovers of luxury camping who book a mobile home at Camping Les Fontaines Campsite will be able to spend sunny days exploring the countryside, while there is also an excellent range of facilities and amenities located on the site itself. Get in touch with LUX-camp to order your camping holiday today. A Welcome to Les Fontaines Campsite! What Makes Camping Les Fontaines Campsite So Special? 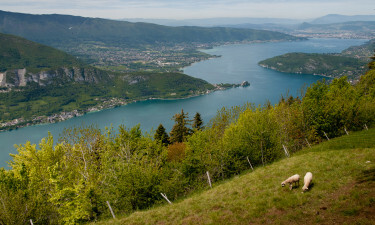 This campsite is situated at the edge of Annecy Lake, which is the perfect place to go boating on a sunny day. This lake also boasts several scenic spots where visitors to the area can go fishing and take part in a range of other types of aquatic activities. Camping Les Fontaines Campsite also features two stunning outdoor swimming pools that come complete with waterslides to play on and are set with sun loungers where guests can unwind for a while. The children are sure to get a lot out of their camping holiday due to the exciting entertainment programme that is provided by the staff. Sports activities, shows and a wide range of other activities are organised throughout the daytime and into the early evening and this is the perfect way for the kids to have fun and make new friends while their parents unwind for a while. Happy campers who book a mobile home at Camping Les Fontaines Campsite will be able to spend their days exploring the enchanting area. The charming town of Chaparon is situated just two miles away and features several shops and attractions for visitors to explore. The majestic Taillefer mountain forms a pretty backdrop to the area and lovers of the Great Outdoors will find several excellent hiking and walking trails that take them through the countryside to the foot of the mountain. 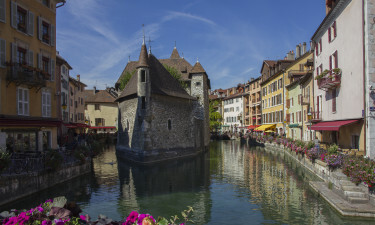 The onsite restaurant features a large patio area and this is the ideal spot to sit and soak up the scenery while sampling a wide range of traditional French dishes that are made with fresh local produce. The restaurant also serves popular European snacks and light bites that can be taken away to eat while exploring, while the onsite bar is stocked with a good range of different wines and spirits. People who want to sample fresh local produce will find an excellent range of different types of sausages, cheese, fresh bread and much more at the onsite supermarket. This makes packing a picnic to eat beside the lake, while people who want to prepare meals from scratch to eat in the comfort of their mobile home or on the large lawn will also find everything they could possibly need.